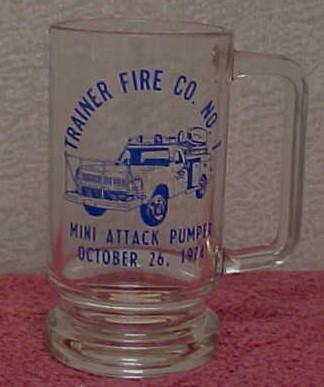 Glass Mug....(front ) "Trainer Fire Co. No. 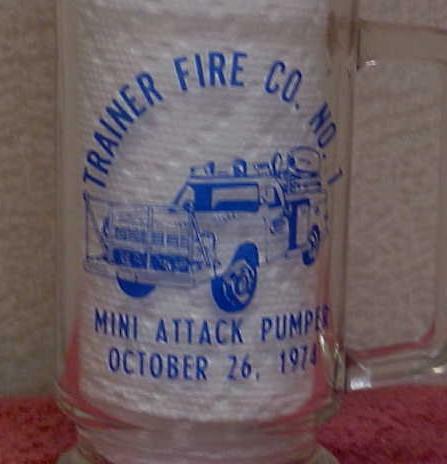 1... Mini Attack Pumper...October 26, 1974 with a pic of a fire truck in the center all in blue lettering. 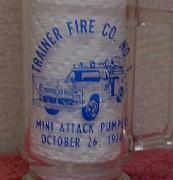 Mug measures approximately 2 3/4" diameter (top) x 5 1/2" high x 2 3/4" diameter bottom. This mug is part of a large collection. No cracks or chips. Used and in good condition. PRICE: $7.99 plus $1.50 special handling charge.